As it's known most extreme bands in the early '90s started with old school death. But there were some like Polluted Inheritance, who may sensed the change in the death metal scene after some bigger bands played more technical. Their debut was a technical death album already influenced mostly by the Floridan scene. Most of the scene features like the style, diversity and the strong, characteristic sounding could be actively sensed, so it's like an example for an impermanent state that shows a detail of this musical progression. It's a quite intense album compared to the main scene's countless of death metal produces, on the side of their well used up influences from the Floridan scene, the technical development of their music increased it's diversity. Effective riffings, noisy classical-sound short solos, intense hammering and of course common theme changes are the main features. 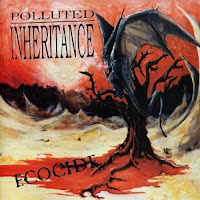 "Ecocide" is a less known, but important technical death metal classic.